Welcome to the Piupaws cattery website! Welcome to meet our beautiful cornish rexes in the Piupaws cattery! Cornish rex is an elegant breed with a distictive curly or wavy coat, which has no guard hair. 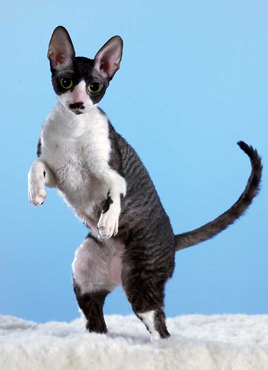 The first cornish rex Kallibunker was born in Cornwall, England in 1950 and all the cornish rexes are his offspring. Cornish rexes are active cats who spend their lives making their owners' lives more interesting. They are not "decorations", but are always were you are and do what you do, usually it's done by sitting on your shoulder. They are very human oriented and show their love by purring to the person they think is worth it. If you have once owned a cornish rex, you can never live without again. A house without cornish rex is not a home!